Unlike most marine organisms, blue crabs mate and spawn at different times. 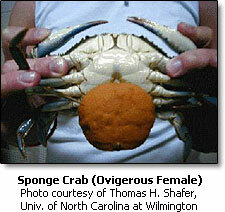 During mating the male crab transfers his sperm into special sac-like receptacles in the female crab. These receptacles store the male's sperm so that it can be used for egg fertilization at a later time. Viable sperm can live in the female's seminal receptacles for well over a year and will be used for two or more spawnings. See Mating for more information on this subject. After the female matures and mates, the newly molted "sook" must regain strength and build muscle mass in order to prepare for her migration to high-salinity spawning grounds where she will produce a "sponge" and then release eggs. To prepare for this journey she will remain and forage in the same general area where she mated for a period of weeks to months (Turner, Wolcott, Wolcott, and Hines 2003). It isn't until late September or October that she will begin her migration to the lower Chesapeake Bay to spawn. The "pregnant" females that survive the gauntlet of crabpots, scrapes, trotlines and dredges will usually spawn for the first time the following season since they reach the spawning grounds late in the season. In other words sooks won't release any eggs until approximately 2-9 months after mating, usually May-August the next season. When the female is ready to spawn, egg cells (oocytes) are forced from the ovaries through the seminal receptacles where they are fertilized. The fertilized eggs, which are about 0.25 mm in diameter, are then extruded into a large, cohesive mass or "sponge" that remains attached to fine hairs beneath her abdomen until they hatch (see female anatomy for more information.) The average sponge contains about two million eggs, but may contain anywhere from 750,000 to 8 million eggs, depending on the size of the crab. The sponge is formed in about two hours and is roughly one third the size of the female crab's body. Note that unmated females may produce sponges of unfertilized eggs but this is very rare, as there always seems to be an abundance of males, each capable of mating with many different females. 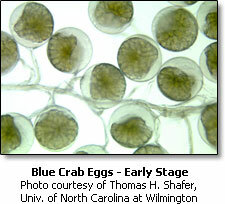 Hatching of blue crab eggs occurs at salinities of 23-33 ppt and temperatures of 66-84º F. (19-29º C.). In the Chesapeake Bay, larval release appears to be concentrated at the extreme lower Bay between the Virginia capes and at the mouths of the Bay's southern rivers (spawning rarely occurs in Maryland and occasionally occurs between the mouth of the Potomac River and Wolf Trap Light where salinities are higher, 15-20 ppt.) Once released, blue crab larvae drift like orphans from the lower Bay toward the open sea to the continental shelf which is where most larval development occurs. On the average, only one out of every million eggs survives to become a mature adult. Mortality of eggs has been attributed to fungal infection, predation, suffocation in stagnant water, and exposure to extreme temperatures. Spawning peaks in the blue crabs are closely associated with the region inhabited. 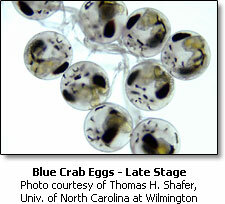 In Chesapeake Bay, for example, spawning is initiated in May and June, with a second spawning in August. In North and South Carolina, spawning occurs from March through October, with peaks from April to August. Around the St. John's River in Florida, spawning occurs from February to October, with peak spawning occurring from March through September. In the Gulf of Mexico, two spawning periods are common: one in February and March, and one in August and September. Although a female will mate only once, she will produce many fertilized egg masses during her lifetime from this single mating. Studies in Florida found that some female crabs produce as many as seven broods (sponges) in one year from a single mating, and up to 18 broods over 2-2½ years. 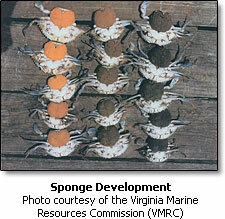 Research at the University of Maryland Biotechnology Institute (UMBI) Center of Marine Biology (COMB) has shown that Chesapeake Bay females were very capable of spawning five or more times, though most will not produce more than one or two broods due to their short average life span, typically 1-2 years (their life span is short because most are harvested before they can grow old.) In all cases, successive spawns may occur during the same season or females may overwinter before spawning again the following spring. The presence of empty egg cases on swimmerets or the occurrence of large, bright-red adult nemertean worms (Carcinonemertes carcinophila) on the gills of a mature female indicates that she has spawned at least once (Churchill 1919; Hopkins 1947). After reaching sexual maturity, these worms feed on the egg masses carried by the female crabs and live in the gills of the crab after the eggs hatch (Hopkins 1947). In lower Chesapeake Bay, mature red nemertean worms occurred in the gills of more than 95% of the female crabs that had spawned; immature crabs supported only immature, light-colored worms (Hopkins 1947). Turner, H., Wolcott, D., Wolcott, T., Hines, A. 2003. Post-mating behavior, intramolt growth, and onset of migration to Chesapeake Bay spawning grounds by adult female blue crabs, Callinectes sapidus Rathbun. Journal of Experimental Marine Biology and Ecology 295:107-130. Churchill, E.P., Jr. 1919. Life history of the blue crab. Bulletin of the Bureau of Fisheries 36:95-128.